I realize my journey into technology isn’t normal, per se. Many times people ask me how they can do it, too, and they note how I had advantages that they don’t, so they succumb. Meanwhile, many people in technology note the need to lower the barrier to entry into careers in technology to better foster teams with a variety of thoughts and backgrounds. Research says that this leads to greater business outcomes, and we believe it and want to support it. A lot of times, then, when we see these people (like myself) who have or are in the process of transitioning into a career in technology, we applaud them for their valiant efforts and recognize that even though there were things that lowered that entry-point, their efforts were noteworthy nonetheless, and we go about our lives and move on to the tasks at hand of solving complicated technology issues. This assumes, of course, that there is just one hurdle to get over that barrier and after that you are free to live out your years in knowledgeable, technological savvy and bliss. This, of course, is absurd. We all know that this person will have an uphill climb for quite some time, requiring a massive amount of grit and determination to persist. This blog post, however, is for you, the already-technologically-savvy, because don’t you want someone with that much grit and determination to overcome odds and learn technology totally from scratch to be on your team? We’re not talking about opening the floodgates and letting just anybody on our teams. We’re talking about allowing in those who have proven their ability to learn and push through hard problems to work alongside us. If you want to encourage more people to take the jump into technology, then you sadly can’t take a backseat. There are some things which require your engagement in order to see this come to fruition. I have some ways in which you can 1) lower the initial barrier to entry and 2) ensure continued success after the hurdle of that entry point is crossed. Let’s assume you have someone in mind that you want to encourage in their journey into technology. Here’s my advice to you, whether you be their friend that will walk alongside them, their potential employer, their colleague, or their mentor. 1) Convince them to give you three weeks. Surely you have a problem that needs solving with which this person can experiment. With me it was InSpec. 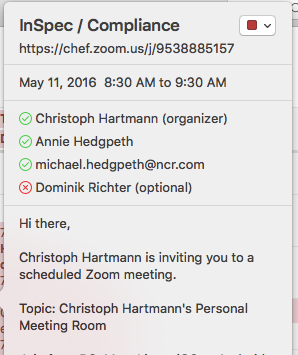 My husband wanted to see if I could prove that InSpec was approachable to non-developers. I totally wasn’t feeling it and thought he was crazy. He convinced me to give it three weeks. I couldn’t fail. If I was able to learn it, then I proved their assumption correct. If I couldn’t learn it, then it was valuable information to both him and the authors of the framework. The rest is history. 2) Lend your privilege. If you’re reading this, then chances are that you have some sort of privilege. Anjuan Simmons speaks about lending your privilege to those that could benefit from your platform. I would not have had the opportunities that I’ve been given without so many people generously loaning me their privilege, the most of whom is my husband. He loaned me his knowledge, his network, his time and energy, and his mind. So inspired by the generosity of others, I’m seeking to loan my privilege as I can, too. 3) Do experiments to learn what motivates your apprentice. This might require some trial and error and experimentation. I did a series of experiments to see if I was more of a developer or more of an operations person. Turns out that I have more of a developer mindset, but how would I have known that without discovery? From there, we were able to chart a course of learning, starting very small and building. 4) Create a sense of urgency. Once you have a course charted, then motivation is going to ebb and flow. The only thing that is going to get this apprentice of yours through those valleys is a sense of urgency. For me that meant self-imposed deadlines and goals, public accountability with Twitter and a blog, and a weekly meeting with someone that I didn’t want to let down who was loaning me his privilege. 5) Discover inverted learning. The most overwhelming thing for a person new to technology is the idea that they have to know everything. When I learned InSpec, I didn’t know what I was testing. As an infrastructure auditing framework, I knew that I was testing to see if the infrastructure was the way it was supposed to be, but I didn’t really know what those things meant. I had to dig in to learn that. When I had learned InSpec enough to move on to add Chef to my repertoire, I was able to remediate the failures with a cookbook, furthering my learning of what those audits actually meant. Mind you, I was doing everything with oversight. I don’t propose that you create a bunch of code-monkeys who simple create code that they don’t understand, but rather use the code to teach, grow, and develop thinkers. 6) Don’t rush it! Imagine your student’s learning as a kanban board with columns A (skills they have yet to learn), B (skills they are currently learning), and C (skills they’ve mastered) with the goal of a good flow through the board. As Kathy Sierra notes in her highly recommended talk, we cannot bypass B! If we either pile up too many skills into the B board or we try to rush them through B, then we will end up with a bunch of half-learned skills that will likely be lost. This leads to discouragement, frustration, failure, and a higher likelihood of giving up. Your student is best served with patience, given the allowance to master skills at their own pace. 7) Allow them to specialize in a skill. Once they master a skill, they have the ability to practice it with confidence, advise others on it, and add value! If you’ve invested in the right type of person, then they desire more than anything to add value, and when you allow them to add value, you grow the confidence that will propel them to learn and master even more. 8) Discover what your team is lacking. From what type of minds could your team benefit? What type of problem-solving is your team lacking? In what type of person do you want to invest? Where can you find this person? Can you make the bandwidth to invest properly in someone like this? Can you afford not to? 9) Set them up for success with mentorship. Your apprentice’s uphill climb will last for quite some time. They will need mentorship focused on growth and development. Start out being very explicit in what is expected of them. Very slowly, be less and less explicit. Protect them from failure and set them up for many wins, big and small alike. Their confidence is key in this first year of transition. Without it, their grit and fortitude will not last. I hope this propels you to be an integral part of someone’s story. They need you, and you can be a game-changer for them.